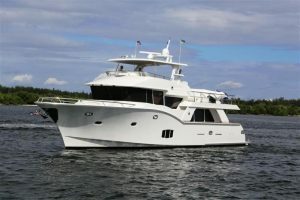 Check out this explorer used 70' Argos yacht for sale! : Atlantic Yacht & Ship, Inc. Check out this explorer used 70′ Argos yacht for sale! Andrey Shestakov reminds us of the used 70′ Argos yacht that he has for sale in Florida. The seller is motivated to sell and looking for offers / trade offers! In the first place, this yacht was purpose-built for challenging seas and frequent Gulf Stream crossings. Furthermore, this used 70′ Argos yacht for sale features an unique profile with a low center of gravity. This results in significantly reduced roll at sea. Her proprietary hull is the world’s first true hybrid providing both excellent range and high-performance speed. Moreover the Argos Gulfstream model sleeps six guests in three posh staterooms with ensuite heads. After all additional luxury appointments include a large pilothouse. As well as a spacious galley, a beautiful saloon, a discrete day head, and a multipurpose split-level sundeck. This sundeck offers infinite possibilities for entertainers and sports enthusiasts alike. This Argos yacht for sale, known as “SEA ROVER” includes crew quarters for two. The custom-built Argos G70 is fitted with CAT C-12 715 HP engines. With these a cruising speed of 17 knots and maximum speed of 20 knots is achievable. Also, with a range of over 2,000 nautical miles at passage-making speeds. Concept and design of the Argos Yachts series was carried out by the company’s internal design team. Internationally renowned architect Howard Apollonio led the naval design. For more information on this 70′ Argos yacht for sale in Florida be sure to contact Andrey Shestakov today!